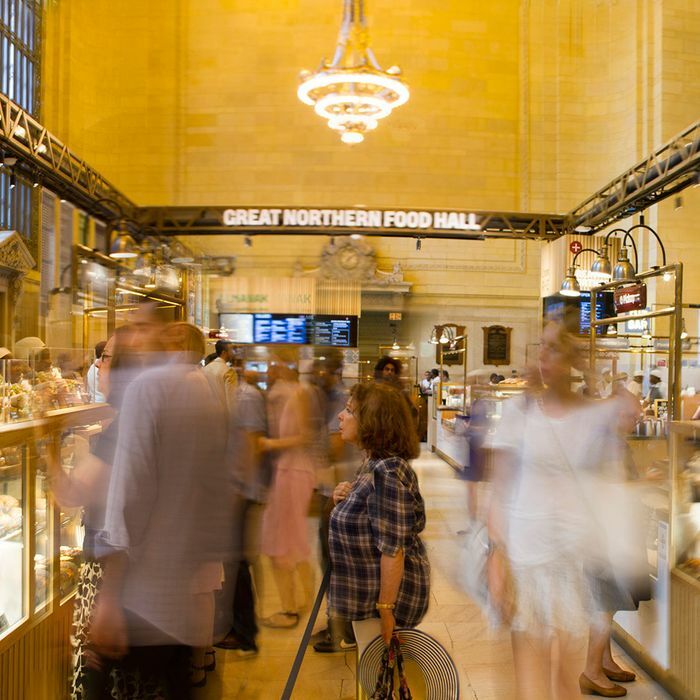 Like many food courts, Grand Central’s Great Northern Food Hall has a cinnamon bun. But it’s not what you think. This cinnamon bun is called a kanelsnurr (roughly “cinnamon spinning thing” in Norwegian). And it’s almost as notable for what it’s not (a colossal T.J. Cinnamons–style blob of dough drenched in gobs of sugary goo) as for what it is: an elegant, intricately braided little pastry with an unadorned surface resembling an unsalted pretzel, its innards judiciously slicked with cinnamon, sugar, and cardamon. Eating a kanelsnurr in its entirety isn’t a wild indulgence. It’s not a self-destructive act or a cry for help. It won’t induce a food-court coma. Frequenters of food courts, in fact, may not even recognize it as a cinnamon bun. In a word, a kanelsnurr is the anti–T.J. Cinnamons roll. And, in a way, Great Northern might be the anti–food court. It’s the handiwork of Claus Meyer, a Danish-food magnate and serial multitasker who, having conquered Copenhagen with a vast array of food businesses, has recently landed in New York with a mind-boggling to-do list, part entrepreneurial and part activist. He’s kind of like Alice Waters, Danny Meyer, Howard Schultz, and Michael Pollan all rolled into one. Besides co-founding Noma with René Redzepi, Meyer helped define New Nordic cuisine in a ten-point manifesto, which, reduced to its essence, says eat local, eat seasonally, eat sustainably, and eat well. As a mission, it’s got legs. These days, Meyer has channeled his urge to proselytize into far-ranging projects like cooking schools in Danish prisons and the roastery and neighborhood restaurant he plans to open later this year in Brownsville, Brooklyn. First, though, he launched a two-pronged project at Grand Central: an upscale tasting-menu restaurant, Agern, in a onetime men’s lounge, and the populist Great Northern Food Hall in the grand public space of Vanderbilt Hall next door. This venture breaks many rules of the modern-day food court: There’s no deep-fried stoner food, no stunt burgers, no fusion tacos. Each stand is a unique part of a singular culinary vision — something like Eataly, but without the overriding retail component. The food is, if not always overtly healthy, then fresh and whole and real, and sourcing is paramount. The hall is beautifully lit, welcoming, and thoughtfully designed — a serene oasis for commuters and a culinary destination in its own right. The various stands or stations (management calls them “pavilions”) are clearly marked and easy to navigate. There is some overlap from stand to stand, and many Danish words to stumble over, but here’s all you need to know: Visitors to this grazing ground will find very good tossed-to-order lunchtime salads (herring-dressed Caesar, cabbage-and-chicken), unusual juices, and yogurt parfaits (all of the above are at the Almanak stand). But grains reign supreme. Great Northern is all about nutty, crusty, chewy, whole-grain, high-hydration, tender-crumbed, altogether superb breads (and pastries), and things you put on top of or in between them. To experience the in-house bakery’s full range, you’ll want a smørrebrød or two (found at the Open Rye stand), the open-faced Danish sandwiches on slabs of sunflower-seeded rye with toppings like chicken-liver mousse and rhubarb compote, or perfectly cooked (between runny and fudgy) soft-boiled eggs with excellent mayonnaise and tiny Nordic shrimp, or pickled herring, or smoked pork belly, or beef tartare, all elaborately garnished and finished to order with touches like chicken-skin chips or fresh-grated horseradish or onion ash. At Meyers Bageri (bakery), you’ll find thin and chewy-crisp flatbreads as good as Sullivan St Bakery’s Roman-style pizza squares, with rye and potato worked into the dough and toppings like asparagus and bacon, or four kinds of alliums and goat cheese. The same stand turns out hot sandwiches that could hold their own against the best of our homegrown heros — especially the intense spice-rubbed lamb belly, garnished with minty mashed peas, pickled greens, and thick yogurt. “Morning roll” is yet another sandwich category, this one targeting time-pressed bagel-eaters: Four varieties of sturdy whole-grain rolls are filled with Danish cheese and butter, or split-pea hummus, or smoked cream cheese, or peanut butter and sea buckthorn, the beach plum of the Danish coastline. Over the course of a half-dozen visits, we interrupted our sandwich chomping to sample other Nordic specialties. Of these, only the Danish-style hot dogs (served around the corner in the shuttle passage) disappointed: The buns were too big and bready, and the busy condiments seemed more confusing than coherent. Admittedly, this is an ingrained culinary bias — if you’ve been raised on diet of Nathan’s and Katz’s, of mustard-and-sauerkraut minimalism, then an overdressed Danish dog is a hard sell. But the equally foreign porridges served mornings at the Grain Bar are a taste easily acquired: Bowls of pearl barley, flavored with peaches and lemon verbena or enriched with greens, mushrooms, and goat cheese, would fortify modern-day Thors, and the amazing cold rye-bread porridge called øllebrød, an exquisite brown mush lightened with vanilla-milk foam, could serve as a dessert at the neighboring Agern. More sweets are found at the Bageri and also at the Brownsville Roasters coffee bar, which dispenses light-roast brews and exemplary Danishes. Of these, we recommend the poppy-seed tebirkes and its twistier cousin, the sesame-and-poppy-seed frøsnapper, both layered with almond paste, and both miracles of pastry perfection. It would take many, many visits to this Nordic wonderland to make your way through every smørrebrød, hindbaersnitter (like a Linzer cookie crossed with a Pop-Tart), Icelandic-skyr-and-granola parfait, and licorice-infused cocktail. But Claus Meyer is putting down roots and thinking long term, with forthcoming facilities for fermenting, butchering, and dairying. As you can tell by the explanatory signage, he’s come to America to spread the New Nordic gospel, starting with a train-station food court, converting commuters into porridge-slurping, sea-buckthorn-popping, kanelsnurr-nibbling disciples. Prices: Sandwiches, salads, and porridges, $3.50 to $16. Open: 7 a.m. to 8 p.m. weekdays, 8 a.m. to 7 p.m. weekends, with certain foods available only during designated hours. Ideal Meal:For breakfast: Peach porridge or sea-­buckthorn-and-­carrot yogurt parfait, and frøsnapper. For lunch: Lamb-belly sand­wich, or any smørrebrød, and maple-whiskey tart. Note: In addition to beer, wine, and cocktails, the hall’s two bars serve charcuterie, cheese, and various snacks. Scratchpad: Two stars for the quality of ingredients and range of choices and another for the disarmingly friendly and generally pro­ficient service.